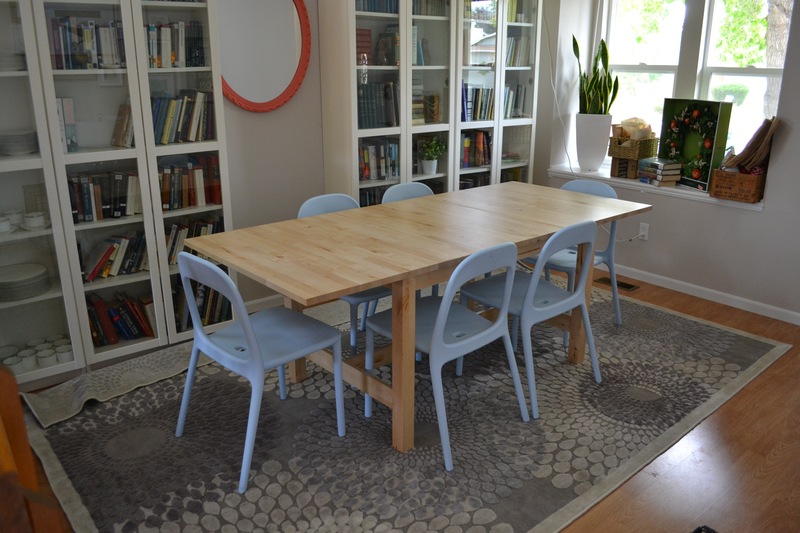 « to rug or not to rug? 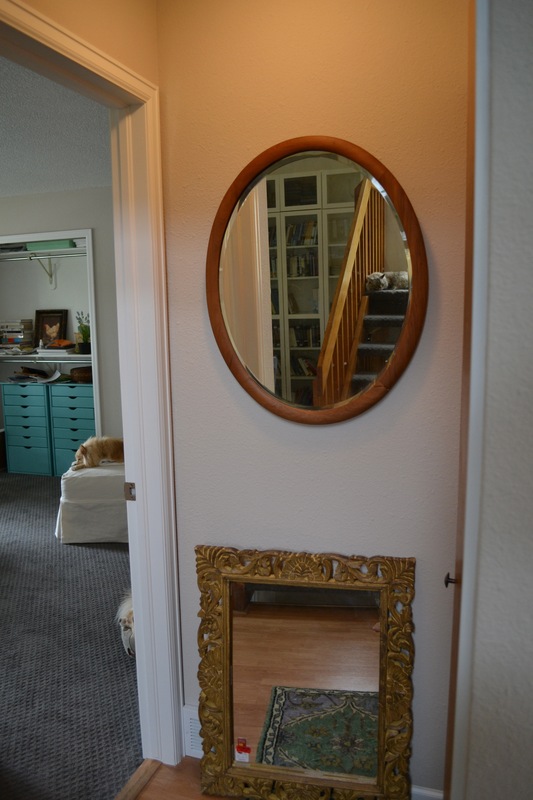 The mirror below is the Homegoods clearance mirror that I went back and got after it went down another $19; I’ve been trying it in the two bathrooms to see if it could work above either of the vanity cabinets. They’re both pretty blocky and ugly, so the mirror kind of fights with them. I thought about painting it white, but I think the frameless mirrors I got at Lowe’s are probably a better choice for toning down the builder-basic, almond and linoleum. The mirror above is an antique that used to hang in Madison. Looking back at that old post—at the old context of this old mirror—makes me miss the way that house looked. It looked like me. This house doesn’t look like me—yet—and really, it’s a process of getting it to look like us, which is a bit harder. There’s a lot of negotiation, and a back and forth—not only between our tastes, but also between the space and the things that fill it. This house is a year younger than I am; the mirror is probably 60 years older than I am. All the same, I do not miss the way the old house felt—like a dollhouse, a shoebox—but the wood floors, the bathroom, the remodeled kitchen… those, I miss. Last night, I was reading on the couch in our living room, looking up at the vaulted ceiling and across to the open space of the dining room— I love the openness and the height of this space. 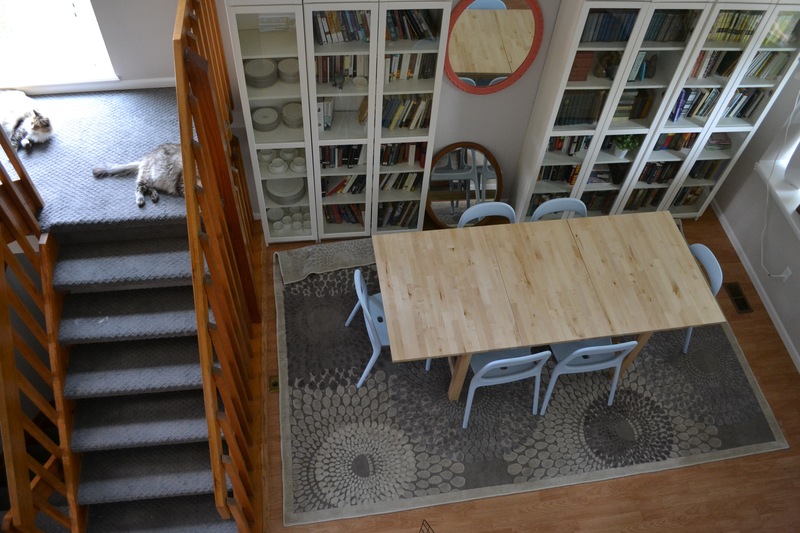 This rug is more along the lines of 8′ x 11′, which improves the balance somewhat, though, if we keep it, we’ll need to empty the bookshelves (!!!) and slide it under them so that it goes all the way to the wall. Right now, the rug blocks the entryway if it’s pulled out even with the shelves. The (unwise) thought of taking a pair of scissors to it may have crossed my mind. So, rather than traditional and wool, we’ve got modern and polypropylene. And majorly marked down on clearance… yes, at Homegoods. I feel like this pattern looks a bit busy, but really, that’s only noticeable if you stand up on the top landing. 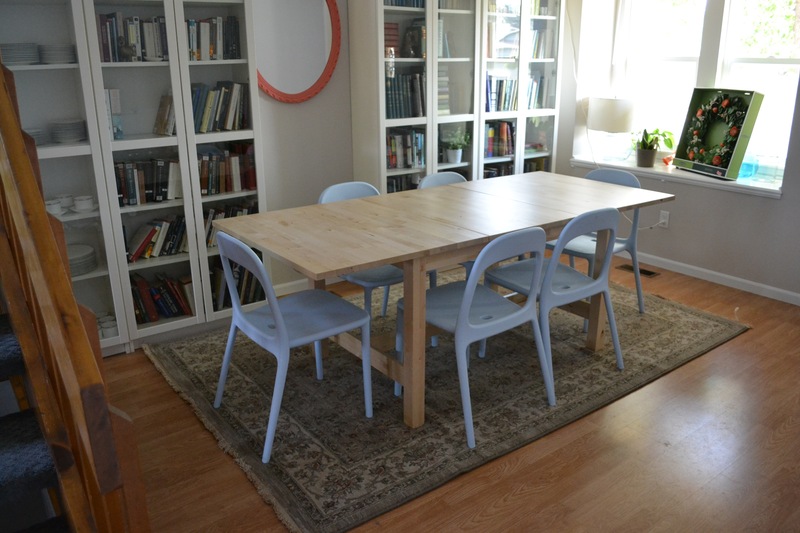 It’s a big rug with a big pattern, but it’s a very big space, too. I think that my brain is still considering what would have worked in the last house—finding what works here is rather different. Things are still a mess in the window alcove. I’m not sure about that coral-colored mirror. I bought it at the Urban Outfitters in Madison one year when they were clearing out their vintage window staging stuff. Then I painted it. I could paint it again. I like the oval balanced between the bookcases. The chairs are still awfully blue. I don’t know. Better? Maybe not the best? Maybe I need to stop being such a perfectionist?